Steve Jobs: "Is $100 Enough to Silence iPhone Complaints?" 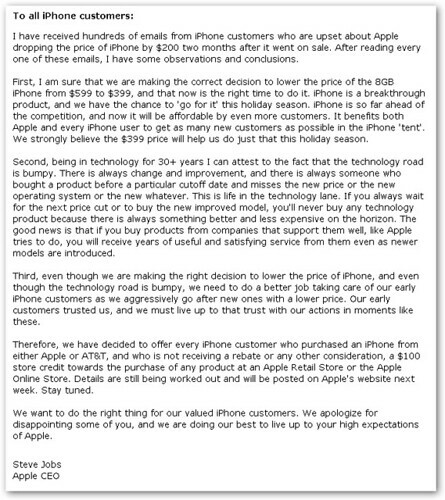 After cutting the price of the 8GB iPhone by $200 yesterday and receiving a torrent of angry complaints from iPhone owners, Steve Jobs has announced that existing iPhone owners will receive a $100 Apple store credit. The price cut comes only 2 months after the iPhone's release and is intended to help Apple "go for it" this holiday season. More details on how to actually claim your credit will be posted next week. However, if you only bought an iPhone within the last two weeks, you may be able to get an actual cash refund. According to Apple's return policy, you have 14 days to return any purchases for a full refund minus a 10% restocking fee. Is Your BitTorrent Download Slow Because of This?